The study aimed to determine additional costs of healthcare-associated infections (HAIs) in patients undergoing endourologic surgery. It also aimed to evaluate the effect of infection control measures on costs of HAIs. This interventional study carried out in patients admitted to the Department of Urology at Osmangazi University Hospital between January 2014 and October 2015. All surgeries were examined in the pre-intervention period for six months and then, a prevention package and education period, which intended to reduce hospital infections, were implemented. In the post-intervention period, all endourological operations were examined for 2 months. 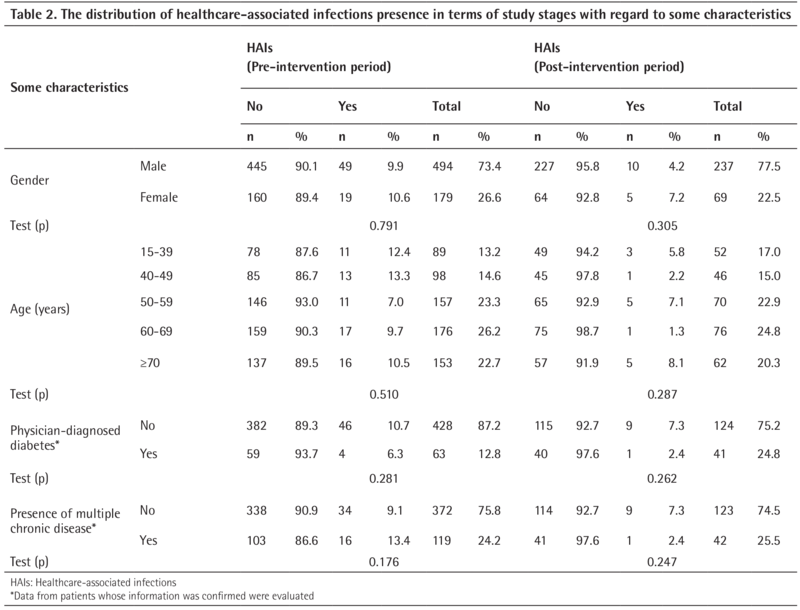 The prevalence of HAIs in the pre-intervention and post-intervention periods was 10.1% and 4.9%, respectively. 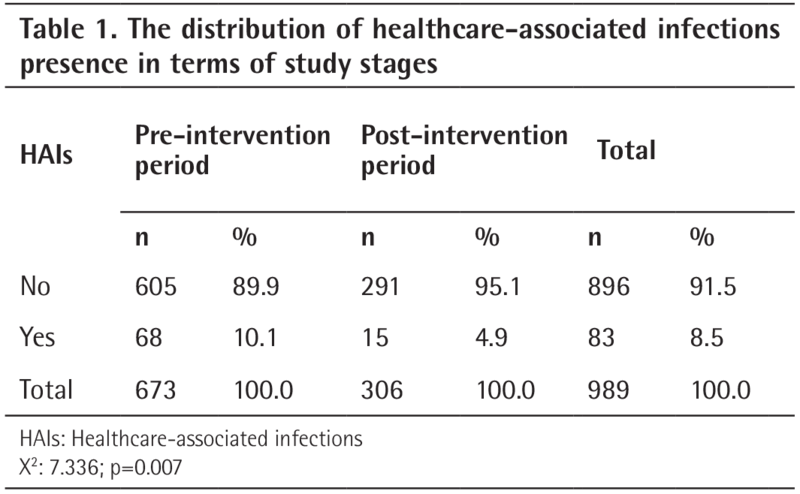 Patients who had healthcare-related infections before or after the intervention had higher costs compared to those who did not get infections. It was found that HAIs decreased by 51% after the intervention (relative risk: 0.49, 95% confidence interval: 0.28-0.86). Thus, an additional cost of 146.332.8±139.29 TL was saved. It is concluded that monitoring and reporting of HAIs regularly by using a simple but effective and evidence-based infection control practices and education programs could decrease the frequency of infection, high additional costs and length of hospital stay. Besides posing a big threat to patient safety, healthcare-associated infections (HAI) cause serious additional costs and they are important cause of mortality in developed countries. While it is not possible to prevent all the cases of HAIs, it is probable to decrease HAI frequencies, high extra costs, high levels of mortality and lengthy bed-days through continuous monitoring and feedback of HAI, use of simple but extremely effective, evidence-based infection control systems and education and trainings. Therefore, the current study will provide additional information to the literature and will guide the surgeons willing to reduce HAIs. Although many developments have been observed in the field of medicine, healthcare-associated infections (HAI) have become an important health problem all over the world due to high rates of mortality and morbidity as well as economic losses (1,2). According to the studies carried out in developing countries between 1995 and 2008, while the prevalence of HAIs was 5.7-19.1%, the incidence rate was reported as 1.7-23.6% (3). It has been ascertained that HAIs extend the length of hospital stay for 4 days on average and leads to 60.000 deaths in a year and, the USA spend up to 10 billion dollars more on it (4). Although all the HAIs cannot be avoided, in a systematic review by Aboelela et al. (5), it has been reported that the interventions containing prevention packages are effective in reducing the HAI frequency. After a training program containing multidimensional infection control approaches, such as bundle of infection control interventions, education, surveillance, and performance feedback, carried out in 15 developing countries, including Turkiye, the incidence rate of HAIs decreased by 37% (6,7). The prevention attempts against HAIs are cost-effective initiatives (3). 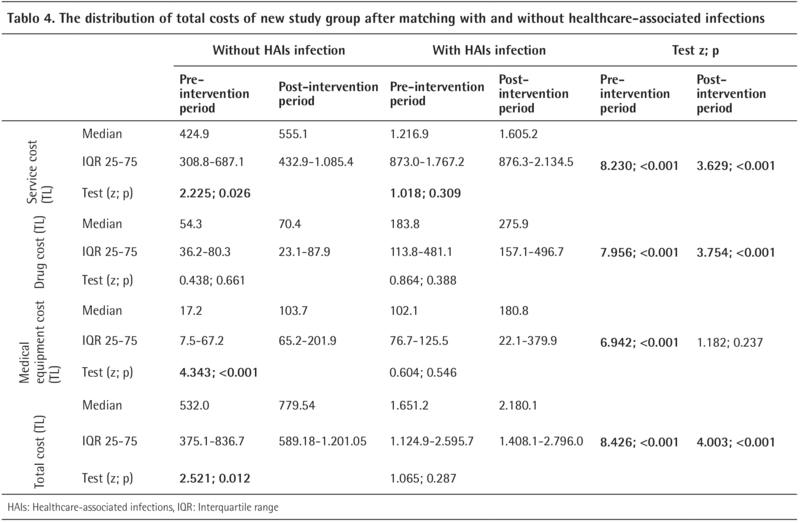 In a study examining the cost of HAIs for 4 years after an infection prevention and control program carried out on 82.046 patients in 6 intensive care units in Canada, it has been reported that HAI was prevented in 4.739 patients in total and an additional cost of 9.1 billion dollars was avoided (8). Scarce resources allocated for the offering of health services will be fairly used by reducing the infection frequency through HAI prevention and control efforts by the adaptation of health professionals (9). The aim of the study was to determine the extra costs brought by HAIs after endourological surgery in the Department of Urology at Eskişehir Osmangazi University Hospital and to evaluate the effects of the infection prevention and control measures on costs. This intervention study was carried out on patients who underwent an endourologic surgery in the Department of Urology at Eskişehir Osmangazi University Hospital between January 2014 and October 2015. In this study, data was gathered by active surveillance based on patient and laboratory records. This study design was approved by the Eskişehir Osmangazi University Ethics Committee (80558721/27). Consent form was filled out by all participants. All endourologic surgeries were examined in the pre-intervention period for six months (1st January, 2014 to 30th June, 2014) and post-intervention period for two months (1st February, 2015 to 31st March, 2015). Between July 2014 and January 2015, the seven-month interventional study was carried out. Patients included in the study were those aged 15 years and older and diagnosed with any infection upon questioning about symptoms of the urinary system infection and via physical examination. Neutropenic, pregnant and immunosuppressed patient, and those, who had any infection, urinary catheter inserted for any reason in the last 2 months and stayed in hospital less than 24 hours, were excluded from the study. In the pre-intervention period, of the 1384 endourological surgical procedures, 1095 (79.1%) were examined in accordance with the inclusion criteria. In the post-intervention period, of 595 endourological surgical procedures, 461 (78.5) were examined. Patient age, gender, diagnosis, chronic diseases, hospital admission and discharge dates, the order in the queue for the operative room and presence of HAI were recorded. Following the collection of the data, the patient’s billing information was taken from the hospital information system and recorded with the permission of the hospital management. The cost of the treatment was included in the study. The billing information was examined in detail and the treatment costs were calculated. Costs were analyzed in four groups as service cost, drug cost, medical equipment cost and total cost. Following the completion of the pre- and post-intervention periods, patients having HAI and those without HAI were matched. Age, gender and primary diagnosis of patients were used as matching variables. Patients who met the matching criteria with no HAI were matched with each patient with HAI. With a simple random number generating algorithm, a patient with no HAI was selected for each patient with HAI. Thus, it was aimed to reduce the confounding effect of other causes that increases cost. With this new dataset, the additional cost of HAI was determined. At this stage of the study, a questionnaire consisting of 6 open-ended questions was prepared based on the the aim of determining the HAI prevention packages (10,11). This questionnaire was administered to the urology department lecturers, research assistants, operating room team and inpatient care nurses. After analysing the questionnaire, it was realised that inadequate number of staff, improper sterilization, inadequate medical supplies, inadequate education and inadequate physical environment of the healthcare workplace lead to nosocomial infections. A prevention package was developed to reduce HAIs by evaluating the results of the feedbacks. Implementation of the prepared prevention packages and trainings were completed in January 2015. * Distribution of informative brochures prepared to prevent HAIs; the brochure emphasizes that all individuals could play a role in the prevention of infections and indicate what can be done to keep patients and their relatives healthy while receiving health care (face-to-face, 1 sessions, 10 minutes, by the main author). In addition, the brochure included the correct hand washing steps with visual supports suggested by the World Health Organization (WHO), five-stepped, and objective tasks to teach the right hand washing behavior. These steps were one of the most important steps in preventing HAIs (12). In terms of urinary system infection; at least one of the following sign or symptoms should be present: fever (>38 °C), urgent need for urination, frequent urination, dysuria, suprapubic tenderness, pain or tenderness at the costovertebral angle, and positive urine cultures (>105 cfu/mL) which are the main criterion for HAIs with the presence of at least one of the laboratory findings such as positive dipstick test for leukocyte esterase and/or nitrite, pyuria, and microorganisms in gram examination (13). Relative risk (RR) was also calculated in groups with and without HAIs. The incidence density was used to determine the HAIs dimension. The data was analysed using IBM-SPSS (version 22.0) statistical package program. For descriptive statistics, the frequencies, percentage, mean ± standard deviation, median, minimum (min), maximum (max) and interquartile range (25-75) values were used. A chi-square test and the Kolmogorov-Smirnov test were used to compare the frequency between the groups. For the analysis of the costs, the Shapiro-Wilk test was performed and the Mann-Whitney U test was used for the comparison of the groups because the normality test did not fit the normal distribution. EPI Info V7 (CDC, Atlanta, Georgia, USA) package program was used to calculate the risk ratio. For statistical significance, p≤0.05 was accepted. At the pre-intervention period, a total of 1.095 (79.1%) endourological surgeries were performed in 673 patients with a total of 2.428 bed-days. The average age of the patients was 57.2±15.1 (min: 15.0, max: 91.0) years. 26.6% (n=179) of the patients were female and 73.4% (n=494) were male. At the post-intervention period, a total of 461 (78.5%) endourological surgeries were performed in 306 patients with a total of 1.089 bed-days. The average age of the patients was 55.5±15.3 (min: 15.0, max: 91.0) years. 77.5% (n=237) were male. There was no difference between the pre- and post-intervention groups in terms of gender (p=0.177) and age (p=0.583). At the pre-intervention period, 10.1% of patients had nosocomial infection. At the post-intervention period, the nosocomial infection rate decreased to 4.9%. The incidence density of nosocomial infection was 28.0%0 at the pre-intervention group, however, this value was measured as 13.7%0 after the intervention. There was no difference between the pre- and post-intervention groups in terms of nosocomial infection with regard to gender, age group, physician-diagnosed diabetes, and the presence of multiple chronic diseases (p>0.05 for each) (Tables 1, 2). The risk of nosocomial infections was increased in patients with a later order in the operation queue, and the number of bed-days in patients having nosocomial infection was higher in both pre- and post-intervention period (p<0.001 for each) (Table 3). After matching the data set, the costs of patients with nosocomial infection were higher than those of without nosocomial infection for both pre- and post-intervention period (p<0.001 for each). Although the total cost of the patients without nosocomial infection at the post-intervention period was higher than the costs at the pre-intervention period, this value did not change for the patients with nosocomial infection (p=0.012 and p=0.287, respectively) (Table 4). The study groups were designed following matching; cost difference was calculated by subtracting the cost of patients with nosocomial infection from that of patients without nosocomial infection at the pre- and post-intervention period. While the difference in the median cost between patients with and without nosocomial infection before intervention was 1.002.9 TL, this value increased to 1.288.3 TL after intervention. After the matching, the difference in cost between patients with nosocomial infection and those without nosocomial infection was not changed with intervention at all the fields of intervention (p>0.05 for each) (Table 5). The infection frequency was decreased from 10.1% to 4.9% after the intervention carried out in the study. It was determined that with this intervention programme, a 51.0% decrease was observed in the incidence rate of nosocomial infection [RR: 0.49; 95% confidence interval (CI): 0.28-0.86; p<0.001]. Two months after the intervention, nosocomial infection was seen in 15 patients out of 306. If the intervention was not carried out, 31 patients would have had nosocomial infection by taking infection incidence rate before the intervention into consideration. As a result, nosocomial infection was prevented by our intervention in 16 patients. When the post-intervention costs were considered, 146.332.8±139.29 TL were saved by preventing the development of the infection. Today, HAIs are the most common complications affecting hospitalized patients in the world (1,2). Besides posing a big threat to patient safety, HAIs are important cause of mortality. The incidence rate varies from 5.7% to 19.1% in low and middle income countries (3). In their one-day prevalence study performed in a university hospital, Metintaş et al. (14) found a hospital infection prevalence of 13.4%. It has been put forward that HAIs cause serious extra costs in both developed countries and in Turkiye. Due to HAIs, the annual financial losses in the USA and Europe are approximately 6.5 billion US dollars and 7 billion euros, respectively (15). Extra cost for an infected patients has been reported to be 1.963 US dollars by Erbay et al. (16), and 2.026 US dollars by Esatoğlu et al. (17). In our study, the total cost of patients with nosocomial infection at the pre- and post-intervention period was higher than that of patients without nosocomial infection (p<0.001 for each). It has been reported that the costs increase owing to extended length of bed-days for patients with HAI, additional diagnostic tests and in particular, high-cost of antibacterial medicines used for treatment (5). Reducing health-care costs and control of expenditures are the priority of many developing countries. While the share of health expenditures of the gross domestic product in the USA was 8.8% in 1980s, it increased to 15.2% in 2003 (18). Likewise, the share of health spending of the gross domestic product in France, Switzerland, Germany, Belgium, Austria, and Canada is above 10%, while the Organisation for Economic Co-operation and Development average is 9.3% (19). Although the share of health expenditures in general budget is increasing every year, it was 5.4% in Turkiye in 2013 (20). Many countries work on strategies for controlling and minimizing medical errors like HAIs. The USA has not been paying the additional costs of HAIs since 2008 (21,22). It is being discussed whether hospitals with high levels of HAI should receive their reimbursement with 5% deduction on the basis of the Health Practices Statement (20). Aboelela et al. (5) reported that interventions containing prevention strategies were effective in decreasing HAI frequency. It is possible to obtain such potential gains as reducing HAI loads, mortality rates and health expenditures through changing health-care workers behaviors, adoption of infection control practices and and ensuring the continuation of prevention measures (23). It has been demonstrated that use of prevention measures in adult intensive care units of International Nosocomial Infection Control Consortium member hospitals have decreased the incidence rates of HAI by 37-58% and HAI mortality by 58% (23,24,25). In this study the infection frequency has decreased from 10.1% to 4.9% through the intervention which equals to 51.0% decrease in rates (RR: 0.49; 95% CI: 0.28-0.86; p<0.001). In a prospective study carried out in Argentina through an intervention executed (phase 1: surveillance without an education and performance feedback; phase 2: addition of the education; phase 3: addition of performance feedback) HAI rates were decreased by 75% (RR: 0.25; 95% CI: 0.17-0.36; p<0.0001) (26). In analogy to our work, it has been shown in this article that education and training of healthcare workers can result in significant reduction in the rates of HAI. Similarly, in another study carried out in Mexico, an intervention (phase 1: active surveillance; phase 2: control of surveillance period and performance feedback) have made it possible to reduce the HAIs rate by 58% and the mortality rate from 48.5% to 32.8% (RR: 0.68; 95% CI: 0.50-0.31; p<0.01) (27). Health systems, both private and publicly funded, face with the problem of providing cost effective and quality care. In Turkiye, the cost of many infection control measures is directly financed by the own budget of hospitals, while the extra costs caused by HAIs are paid by social security institutions (20). Due to limited resources, it is important to make economically rational decisions in determining the measures to be taken for infection control. In this way, the limited resources are not only wasted and can be used more effectively. Measures for controlling infections and savings will enable individuals to reach health services more fairly (9). In the study conducted by Esatoğlu et al. (17), the extra cost of HAI was reported to be 202.670 US dollars and it was stated that 30.754 US dollars could be saved in 4 months for 57 patients. Similary, a study carried out on 82.046 patients in 6 intensive care units in Canada which examined the HAI costs after infection prevention and control programs, 4.739 cases of HAI were avoided and a total of 9.1 million Canadian dollars was saved (8). After the matching, the difference in cost between patients with and without nosocomial infection did not change with the intervention in all the fields of intervention (p>0.05 for each). The reason for this issue could be that the purpose of the intervention was decreasing HAI frequency rather than reducing the costs of offered services. As a result, 16 cases of nosocomial infection were prevented through the intervention carried out within the study period. When the post-intervention costs were considered, it was observed that 146.332.8±139.29 TL were saved through preventing the development of the infection. In a systematic review by Bell et al. (28) investigating the cost-efficiency analyses published between 1976 and 2001, it was reported that only 9% (130 out of 1433) of the studies saved money and improved health simultaneously. According to the report by WHO, any intervention which provides saving three times more than gross national product per capita in a country could be counted as a cost-effective intervention (29). When gross national product per capita in Turkiye in 2014 (22.753 TL) is taken into consideration, the intervention carried out within the study could be counted as a cost-effective intervention on annual-basis. In this study, only direct cost was calculated, but indirect cost was not included. While it is not possible to prevent all the cases of HAIs, it is possible to decrease the frequency of HAIs, high extra costs, high levels of mortality and lengthy bed-days through continuous monitoring and feedback of HAIs, use of simple but extremely effective evidence-based infection control systems and education and trainings. In order to realize all these developments, it is necessary to spend vigorous efforts; however, these efforts will contribute not only to decreasing HAI rates but also to eliminating economic losses. Ethics Committee Approval: This study was approved by Ethics Committee of Eskişehir Osmangazi University Faculty of Medicine (approval number: 80558721/27). Informed Consent: Consent form was filled out by all participants. Concept: M.E.G., B.I., B.B., Design: M.E.G., B.I., B.B., Data Collection or Processing: M.E.G., B.I., Analysis or Interpretation: M.E.G., B.I., Literature Search: M.E.G., Writing: M.E.G. Burke JP, Infection control - a problem for patient safety. N Engl J Med 2003;348:651-656. Bates DW, Larizgoitia I, Prasopa-Plaizier N, Jha AK; Research Priority Setting Working Group of the WHO World Alliance for Patient Safety. Global priorities for patient safety research. BMJ 2009;338:1775. Allegranzi B, Bagheri Nejad S, Combescure C, Graafmans W, Attar H, Donaldson L, Pittet D. Burden of endemic health-care-associated infection in developing countries: systematic review and meta-analysis. Lancet 2011;377:228-241. Larson E, Oram LF, Hedrick E. Nosocomial infection rates as an indicator of quality. Med Care 1988;26:676-684. Aboelela SW, Stone PW, Larson EL. Effectiveness of bundled behavioural interventions to control healthcare-associated infections: a systematic review of the literature. J Hosp Infect 2007;66:101-108. Rosenthal VD, Ramachandran B, Villamil-Gómez W, Armas-Ruiz A, Navoa-Ng JA, Matta-Cortés L, Pawar M, Nevzat-Yalcin A, Rodríguez-Ferrer M, Yıldızdaş RD, Menco A, Campuzano R, Villanueva VD, Rendon-Campo LF, Gupta A, Turhan O, Barahona-Guzmán N, Horoz OO, Arrieta P, Brito JM, Tolentino MC, Astudillo Y, Saini N, Gunay N, Sarmiento-Villa G, Gumus E, Lagares-Guzmán A, Dursun O. Impact of a multidimensional infection control strategy on central line-associated bloodstream infection rates in pediatric intensive care units of five developing countries: findings of the International Nosocomial Infection Control Consortium (INICC). Infection 2012;40:415-423. Rosenthal VD, Rodríguez-Calderón ME, Rodríguez-Ferrer M, Singhal T, Pawar M, Sobreyra-Oropeza M, Barkat A, Atencio-Espinoza T, Berba R, Navoa-Ng JA, Dueñas L, Ben-Jaballah N, Ozdemir D, Ersoz G, Aygun C. Findings of the International Nosocomial Infection Control Consortium (INICC), Part II: Impact of a multidimensional strategy to reduce ventilator-associated pneumonia in neonatal intensive care units in 10 developing countries. Infect Control Hosp Epidemiol 2012;33:704-710. Raschka S, Dempster L, Bryce E. Health economic evaluation of an infection prevention and control program: are quality and patient safety programs worth the investment? Am J Infect Control 2013;41:773-777. Folland S, Goodman AC, Stano M. The economics of health and health care. Pearson Prentice Hall New Jersey 2007:6. Saint S, Kowalski CP, Forman J, Damschroder L, Hofer TP, Kaufman SR, Creswell JW, Krein SL. A multicenter qualitative study on preventing hospital-acquired urinary tract infection in US hospitals. Infect Control Hosp Epidemiol 2008;29:333-341. McAlearney AS, Hefner JL. Facilitating central line-associated bloodstream infection prevention: a qualitative study comparing perspectives of infection control professionals and frontline staff. Am J Infect Control 2014;42(Suppl 10):216-222. Boyce JM, Pittet D; Healthcare Infection Control Practices Advisory Committee; HICPAC/SHEA/APIC/IDSA Hand Hygiene Task Force. Guideline for Hand Hygiene in Health-Care Settings. Recommendations of the Healthcare Infection Control Practices Advisory Committee and the HIPAC/SHEA/APIC/IDSA Hand Hygiene Task Force. Am J Infect Control 2002;30:1-46. McGeer A, Campbell B, Emori TG, Hierholzer WJ, Jackson MM, Nicolle LE, Peppler C, Rivera A, Schollenberger DG, Simor AE, et al. Definitions of infection for surveillance in long-term care facilities. Am J Infect Control 1991;19:1-7. Metintaş, S., et al., The Prevalence of Patients with Hospital Infection in a University Hospital: One-Day Prevalence Study. Turkish Journal of Hospital Infections 2002;6:32-40. Organization, W.H. Health care associated infections fact sheet. WHO 2013 09.2015]; Available from: http://www.who.int/gpsc/country_work/gpsc_ccisc_fact_sheet_en.pdf. Erbay RH, Yalcin AN, Zencir M, Serin S, Atalay H. Costs and risk factors for ventilator-associated pneumonia in a Turkish university hospital’s intensive care unit: a case-control study. BMC Pulm Med 2004;4:3. Esatoğlu AE, Agirbas I, Onder OR, Celik Y. Additional cost of hospital-acquired infection to the patient: a case study in Turkey. Health Serv Manage Res 2006;19:137-143. Reed D, Kemmerly SA. Infection control and prevention: a review of hospital-acquired infections and the economic implications. Ochsner J 2009;9:27-31. Graves N, Harbarth S, Beyersmann J, Barnett A, Halton K, Cooper B. Estimating the cost of health care-associated infections: mind your p’s and q’s. Clin Infect Dis 2010;50:1017-1021. Kurutkan MN, Kara O, Eraslan İH. An implementation on the social cost of hospital acquired infections. Int J Clin Exp Med 2015;8:4433-4445. Milstein A. Ending extra payment for “never events”--stronger incentives for patients’ safety. N Engl J Med 2009;360:2388-2390. Stone PW. Economic burden of healthcare-associated infections: an American perspective. Expert Rev Pharmacoecon Outcomes Res 2009;9:417-422. Rosenthal VD, Maki DG, Rodrigues C, Alvarez-Moreno C, Leblebicioglu H, Sobreyra-Oropeza M, Berba R, Madani N, Medeiros EA, Cuéllar LE, Mitrev Z, Dueñas L, Guanche-Garcell H, Mapp T, Kanj SS, Fernández-Hidalgo R; International Nosocomial Infection Control Consortium Investigators. Impact of International Nosocomial Infection Control Consortium (INICC) strategy on central line-associated bloodstream infection rates in the intensive care units of 15 developing countries. Infect Control Hosp Epidemiol 2010;31:1264-1272. Raju TN. Ignac Semmelweis and the etiology of fetal and neonatal sepsis. J Perinatol 1999;19:307-310. Rosenthal VD, Guzman S, Safdar N. Effect of education and performance feedback on rates of catheter-associated urinary tract infection in intensive care units in Argentina. Infect Control Hosp Epidemiol 2004;25:47-50. Rosenthal VD, Guzman S, Pezzotto SM, Crnich CJ. Effect of an infection control program using education and performance feedback on rates of intravascular device-associated bloodstream infections in intensive care units in Argentina. Am J Infect Control 2003;31:405-409. Higuera F, Rosenthal VD, Duarte P, Ruiz J, Franco G, Safdar N. The effect of process control on the incidence of central venous catheter-associated bloodstream infections and mortality in intensive care units in Mexico. Crit Care Med 2005;33:2022-2027. Bell CM, Urbach DR, Ray JG, Bayoumi A, Rosen AB, Greenberg D, Neumann PJ. Bias in published cost effectiveness studies: systematic review. BMJ 2006;332:699-703. Organization WH. Choosing interventions that are costeffective (WHO-CHOICE): cost-effectiveness thresholds. Geneva: World Health Organization, 2009. 2010.